Poll pundits and psephologists may still be debating the outcome of the coming assembly elections in Gujarat, but acccording to the state’s illegal betting or satta market, the Bharatiya Janata Party (BJP), led by chief minister Narendra Modi, will return to power easily. While the odds on BJP and the Congress party were roughly the same a few months ago, they are now overwhelmingly in favour of the former. In contrast, a similar bet on the Congress would earn Rs5. The fortunes of BJP have witnessed a steady rise since the announcement of the elections. “Initially, the odds on both the BJP and the Congress were 90-95 paise each per rupee. While the odds for a BJP win have progressively gone down to 61 paise, 23 paise and now 19 paise" things have become worse for the Congress, say bookies in Ahmedabad. One of them says he will not be surprised if BJP wins more than the 127 seats it presently has. Books for the election are run by bookies such as Dinesh Kalgi, Anil Saree, Gulu Sarkhej and Pradeep Dairy. None of the bookies uses his own name, instead preferring to go by ‘trade’ names. Thus, Anil Saree is a bookie who used to be in the saree business and Gulu Sarkhej is from Sarkhej, a neighbourhood in Ahmedabad. The bookies belong to a network that became active in betting on political fortunes in the state in 1995 when the current Union textiles minister Shankersinh Vaghela ousted the then chief minister and BJP leader Keshubhai Patel. However, the bookies aren’t the people behind the business. In fact, they represent the lowest tier of a structure where the big bosses, large traders who run similar betting syndicates across the country, operate from the four cities of Mumbai, Kolkata, Bangalore and New Delhi. The bookies are hired at a price of up to Rs1 lakh (to run the book) for each event. The bookies carry out an informal ground-level survey of political fortunes in specific regions and collect money from bets. “The Gujarat political scene has been pretty active (in terms of betting) since 1995 and (the size of the betting market) can today be safely valued at anywhere between Rs300 crore and Rs350 crore per political event," says another bookie. The bookie who says a Re1 bet on the BJP will earn 19 paise adds that a similar bet on Modi retaining his seat at Maninagar would earn 70 paise. And a Re1 bet on Modi’s rival and Union minister of state Dinsha Patel winning the seat will earn Rs1.20. According to this bookie, bets on other leaders and other seats will open this week. The elections to the state’s 182-member assembly will happen in two phases on 11 December and 16 December. The results will be declared on 23 December. The bookies have already started accepting interesting bets, called dabba sauda. These include bets on the political fortunes of BJP rebels and the survival of former chief minister Keshubhai Patel, who has made his dislike for Modi’s style of running things in Gujarat clear. Patel is one of the few leaders within the ruling BJP who has a mass following in the Saurashtra region of Gujarat, from where he hails. 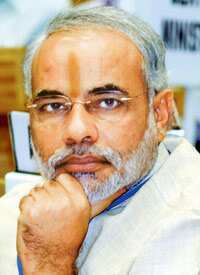 Modi took over from Patel in 2001 before the latter could complete his five-year stint as Gujarat chief minister. According to the bookies, dabba saudas have also been placed on “the recent flip-flop by Uma Bharti." Bharti, a Madhya Pradesh-based BJP leader who left the party to form a splinter group, initially fielded rebel candidates against official BJP candidates in Gujarat, then said she wouldn’t, and then changed her mind again. Unlike cricket matches that attract bets from just about anyone, elections largely attract bets from businessmen and politicians. During the last assembly elections, a candidate “bet on his own victory but lost," says a bookie. He declined to reveall the name of the candidate. And apart from businessmen and state-level politicians, says another bookie, even “big political leaders at the national level" are eager for a little flutter “and place their bets within a close-knit network of bookies."